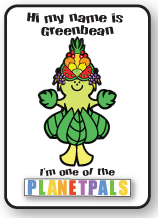 Free Four Seasons Printable Activity: Spring Winter Summer fall with Greenbean "
When you finish this page Planetpals Birthday Party! 1. Enjoy these four Greenbean paper dolls and costumes. You decide which one Greenbean will wear this Halloween! Print them out, cut them up and play! 2. We also have a Planetpals Four Seasons wallchart. Print it out, hang it in your room and enjoy it all year round! E tips that are a howl! Four great recycle costumes for Halloween!